*These authors contribute equally to the study. CD8+CD28-T cells (CD8Ts) exert immunosuppressive effects in various autoimmune diseases. The current study was designed to investigate the role of defects in CD8Ts in liver transplantation (LT). The proportion of CD8Ts in peripheral blood was determined by flow cytometry. The mean proportion of CD8Ts was 23.39% in recipients with stable graft function and 16.64% in those with graft dysfunction following LT compared with 19.86% in the healthy cohort. After receiving enhanced immunosuppressive therapy, patients in the rejection group who achieved recovery of graft function showed an increase in the proportion of CD8Ts (from 17.39% to 25.55%), but those in the group with refractory graft dysfunction showed no significant change (12.49% to 10.30%). Furthermore, in the first year after LT, recipients longer removed in time from the LT date exhibited a higher proportion of CD8Ts. Patients benefited most from tacrolimus concentrations of 5-10 ng/ml in the first year after LT and 0-5 ng/ml thereafter. Moreover, the change in the proportion of CD8Ts (ΔCD8Ts) was significantly higher in recipients with stable graft function than in those with graft dysfunction. These results suggest that a high frequency of CD8Ts prevents rejection and contributes to reduce immunosuppressant dosage and even induces tolerance. The burden of hepatitis B virus infection is heaviest in China, where approximately 20 million individuals have chronic hepatitis B and about five million patients eventually progress to irreversibly decompensated liver cirrhosis or hepatocellular carcinoma (HCC)(1). Liver transplantation (LT) is considered the best life-saving therapy for patients with end-stage liver disease. In recent decades, the development and broad administration of immunosuppressive drugs has contributed to increased graft survival rates(2). However, although rejection is commonly mild for LT compared with that for other solid organs, life-long immunosuppressive therapy is still required(3). Accumulating evidence has confirmed that adverse effects such as chronic kidney dysfunction, recurrent and de novo malignancy, infections, and cardiovascular events have become the dominant concerns associated with long-term administration of immunosuppressants, particularly calcineurin inhibitors (CNIs)(4). Undoubtedly, a minimum immunosuppressant strategy or complete withdrawal is beneficial for improving long-term survival rate and quality of life for recipients after LT(5). Prospective multicenter clinical trials have shown that immunosuppressive drugs could be completely withdrawn for up to 20% of recipients with LT(6, 7). A comparison with recipients who showed failure of immunosuppressant withdrawal suggested that an increased proportion of regulatory T (Treg) cells is a crucial distinguishing immune characteristic(8). In one study, Okumura et al. transferred enriched, ex vivo-expanded regulatory T-cell into 10 consecutive adult recipients early post-LT. At the end of the pilot study, these candidates were immunosuppressant free for more than 1 year, revealing that regulatory T-cell-based cell therapy was safe and effective for drug minimization and induction of operational tolerance in LT(9). Activation, expansion and differentiation of effective primary T cells in allograft rejection is dependent on CD28-mediated co-stimulation(10). Loss of the CD28 co-stimulation signal results in a CD8-positive T-cell-mediated immunosuppressive effect through decreased expression of the co-stimulatory molecules CD40, CD80, and CD86 in CD4+ T helper cells(11), increasing expression of the inhibitory receptors ILT3 and ILT4 in antigen-presenting cells (APCs)(12-14). It also increases secretion of inhibitory cytokines such as IL10 and TGFβ by cells commonly referred to as CD8+CD28- T suppressor cells (CD8Ts)(15). The role of defective CD8Ts in autoimmune diseases and rejection following organ transplantation has recently been confirmed, an observation that has attracted considerable attention(16). Tulunay et al. reported that a decrease in the CD8Treg population impairs T cell suppression and increases the population of autoreactive B cells, resulting in progression of systemic lupus erythematosus(17). In patients with rheumatoid arthritis, the suppressive function of CD8Ts was found to be deficient, as evidenced by decreased co-stimulator expression and increased expression of PDCD1 (programmed cell death 1)(18). Furthermore, expansion of CD8Ts has been shown to decrease the need for immunosuppressant maintenance and to contribute to preventing acute and chronic rejection and sustaining normal graft function after heart-kidney transplantation(19). However, there is little information available on the clinical significance of CD8Ts, and the factors that contribute to the expansion of CD8Ts after LT are still unknown. Accordingly, this study was designed to explore the protective role of CD8Ts in maintaining graft function and assess the relationship between CD8Ts and immunosuppressant administration following LT. The study was performed in accordance with the ethics guidelines of the 1975 Declaration of Helsinki and with the consent of the Ethics Committee of Zhejiang University. All patients provided informed written consent. Venous blood samples were obtained from 280 adult recipients of a liver transplant. Donor livers were obtained from deceased cardiac failure patients or their living family members. Eligibility for LT followed HangZhou criteria for HCC candidates and standard King's College Hospital criteria for candidates with acute or chronic acute liver failure. Recipient demographics, pre-transplant therapies, operative variables, and pathological characteristics were prospectively obtained from the LT database at the First Affiliated Hospital of Zhejiang University through the hospital information collection system. The post-transplantation immunosuppression protocol consisted of tacrolimus, basiliximab, corticosteroids, and mycophenolate mofetil. The target tacrolimus concentration range was 10-15 ng/mL during the first month, and was subsequently titrated down to the minimum concentration required to maintain long-term stable graft function. Methylprednisolone was initiated at a daily dose of 1000 mg in the perioperative phase, and was gradually tapered and withdrawn during the first month after LT. Mycophenolate mofetil was administered at a fixed dose of 500 mg twice daily after LT. Basiliximab was administrated twice, on post-transplantation days 1 and 4. Recipients were followed closely via a communication system and the outpatient service from the date of hospital discharge to the last follow-up visit. Blood tacrolimus was routinely monitored before daily tacrolimus administration using the PRO-Trac TMII Tacrolimus Elisa Kit (Diasorin, Stillwater, MN, USA) according to the manufacturer's instructions. Biochemical tests, ultrasonography, emission computed tomography, and liver puncture were utilized to monitor graft function. Venous blood samples were divided into two tubes for testing tacrolimus concentration and the proportion of CD8Ts. Peripheral blood mononuclear cells (PBMCs) were isolated and incubated with fluorescein isothiocyanate (FITC)-conjugated anti-CD8 and phycoerythrin (PE)-conjugated anti-CD28 antibodies. Isotype controls were utilized to determine background fluorescence. After washing PBMCs three times with phosphate-buffered saline, CD8 and CD28 expression was determined based on 1 × 105 cellular events using a 4-color FC500 flow cytometer (Beckman-Coulter, Miami, FL, USA). NOTE: Date are presented as frequency (percentage) or mean ± SD. NR, Normal range; AST, aspartate aminotransferase; ALT, alanine aminotransferase; WBC, white blood cell; HBV, hepatitis B virus; MELD, Model for End-stage Liver Disease. Experimental data are presented as frequencies or means ± standard deviation (SD). Student's t test and Fisher's exact test were used to analyze the correlation between the proportion of CD8Ts and clinico-pathological parameters. SPSS19.0 software (SPSS Inc., Chicago, IL, USA) was utilized for statistical analysis, and a P-value less than 0.05 was considered statistically significant. The demographics and pre-transplant diseases of recipients are presented in Table 1. Subjects who had received ABO-incompatible transplants (n=22), kidney-liver transplants (n=1), or a second LT (n=3) were excluded from the study. Of the 264 adult patients enrolled in the study, 196 (74.2%) were men and 68 (25.8%) were women. The mean age of recipients was 50.83±10.15 years at transplantation. Pre-LT diagnoses included HCC and chronic liver failure. The mean MELD (Model for End-Stage Liver Disease) score was 17, the mean Child Turcotte Pugh score was 8, and total ischemia time was 254 min. Except for patients with rejection, recipients were divided based on long-term maintenance tacrolimus concentrations into a 0-5 ng/ml group, a 5-10 ng/ml group, and a >10 ng/ml group. Of the 26 recipients with graft dysfunction, four were confirmed as acute rejection, and the remaining patients were considered chronic rejection. After receiving enhanced immunosuppressant therapy, 15 of these recipients recovered graft function, whereas 11 did not. The demographics and clinical characteristics of both rejection and non-rejection groups are presented in Table 2. Compared with patients without graft dysfunction, patients with graft dysfunction exhibited a significantly reduced proportion of CD8Ts (Figure 1A-C). Specifically, the proportion of CD8Ts was 23.39% in the non-rejection group, 19.86% in the healthy cohort, and only 16.64% in the rejection group (Figure 1D). Furthermore, the proportion of CD8Ts increased from 17.39% to 25.55% in patients who achieved recovery of graft function after receiving enhanced immunosuppressive therapy (Figure 1E). However, in the patient population with refractory graft dysfunction, the CD8T proportion did not increase and was even decreased in some patients, averaging 12.49% before receiving enhanced immunosuppressive therapy and 10.30% after therapy (Figure 1F). In addition, there was no significant difference in tacrolimus concentration between recipients with a high and low proportion of CD8Ts during long-term maintenance. However, 10 recipients in the group with a high proportion of CD8Ts, but only 1 patient in the low-CD8T proportion group, received 0-5 ng/ml tacrolimus for maintenance of graft function (Table 3). Notably, nine recipients whose immunosuppressants were successfully withdrawn exhibited a high proportion of CD8Ts (Figure 1D). These results suggest that a high proportion of CD8Ts contributes to maintaining normal graft function and reducing immunosuppressant requirements. (A-C) The proportion of CD8Ts in a recipient without graft dysfunction (A), a patient with graft dysfunction (B), and a recipient with immunosuppressant withdrawal (C). (D) Summary data showing the proportion of CD8Ts among groups. (E) CD8T proportions in relation to recovery of graft function in recipients with rejection. (F) CD8T proportions in patients with refractory graft dysfunction. Accumulating evidence has revealed that age and immunosuppressants are two important determinants of Treg cell proportions(20, 21). In the current study, recipients 70 years and older with 0-5 ng/ml tacrolimus exhibited lower proportions of CD8Ts compared with other age groups (Figure 2A). Excluding 70 years and older patients, the median proportion of CD8Ts was 26.46% in the >10 ng/ml tacrolimus group, 21.24% in the 5-10 ng/ml tacrolimus group, and 17.32% in the 0-5 ng/ml tacrolimus group (Figure 2B). The long-term presence of alloantigens potentially impairs the immune response and induces immune tolerance. Therefore, we tested whether the time from transplant date affected the proportion of CD8Ts. After adjusting for age and tacrolimus concentration, in the first year, recipients longer removed from the transplant date exhibited a higher proportion of CD8Ts (Figure 2C). Furthermore, in the first year after LT, the proportion of CD8Ts was higher in the >5 ng/ml tacrolimus group than in the 0-5 ng/ml tacrolimus group. However, beyond one year after LT, the CD8T proportion-increasing effect of tacrolimus was lost (Figure 2D). (A) The proportion of CD8Ts in recipients as function of age. (B) The proportion of CD8Ts in patients in >10, 5-10, and 0-5 ng/ml tacrolimus groups. (C, D) Proportion of CD8Ts in patients during the first year after LT (C) and at later time points (D). (A, B) The number of lymphocytes (A) and absolute value of CD8Ts (B) in graft-dysfunction and normal graft function groups. There were no significant differences between groups. (C, D) Median proportion of CD8+CD28+ T cells (C) and ΔCD8T proportion (D) in the normal function group and graft-dysfunction group. There was no significant difference in lymphocyte numbers between the graft-dysfunction group and the normal graft function group, but lymphocytopenia was less frequent in the patient population with rejection (Figure 3A). Although the proportion of CD8Ts was lower in the graft-dysfunction group, the absolute number of CD8Ts was not different between the two groups (Figure 3B). These results indicate that the proportion of CD8Ts is more important than their absolute numbers for maintenance of graft function. 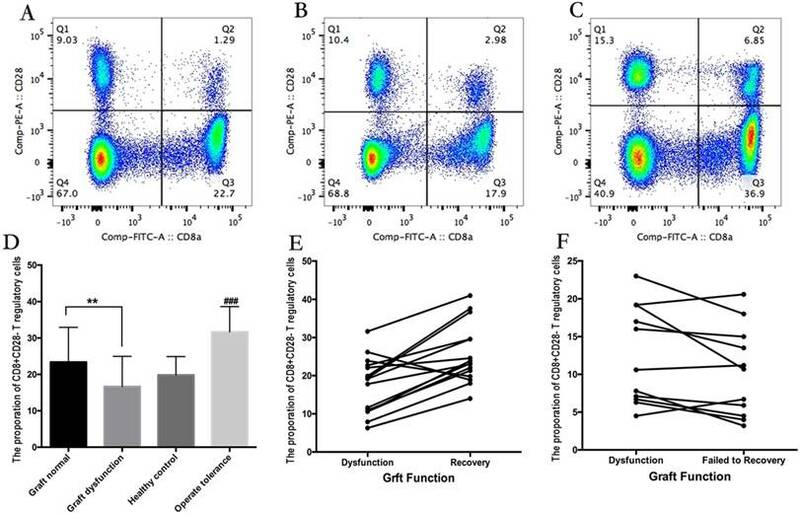 We further found that the proportion of CD8+CD28+ T cells was not different between recipients with stable graft function and those with graft dysfunction (Figure 3C). Interestingly, the ΔCD8T proportion (proportion of CD8Ts minus the proportion of CD8+CD28+ T cells) was higher in the stable graft function group than in the graft-dysfunction group (Figure 3D). 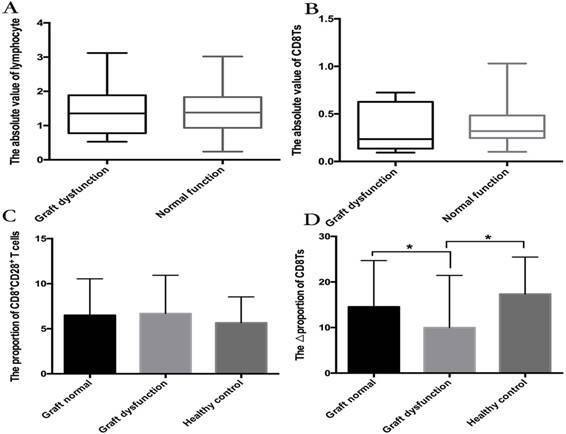 In addition, only two recipients with stable graft function exhibited lower proportions of CD8Ts than CD8+CD28+ T cells, but more than half of recipients with graft dysfunction showed a lower proportion of CD8Ts. These results suggest that the ΔCD8T proportion is a precise predictor of graft function following LT. Although the liver exhibits immune privilege compared with other organs, the rate of acute rejection was still as high as 15.6% from 2005-2013 in the USA according to data from the Science Registry of Transplant Recipients(22). Furthermore, given the seriously limited availability of donor livers compared with organ demand, several transplant centers have expanded the criteria of donors to include donors older than 60 years of age, and those with macrovesicular steatosis ≥ 30%, hot ischemia time > 40 minutes, cold ischemia time > 10 hours, and moderate liver dysfunction(23, 24). The utilization of extended criteria for donor grafts has undoubtedly contributed to the frequency of rejection, which, in turn, significantly increases the hazard ratio for graft failure and death after LT(22). Therefore, powerful immunosuppressive therapy remains necessary, especially during the early time following LT. However, the need to decrease immunosuppressant-related death while preventing rejection presents a conundrum. Abundant evidence has confirmed that a high proportion of immunosuppressive cells, including CD4-positive regulatory T cells and tolerant dendritic cells, reduces the dosage of immunosuppressant required while also decreasing the rate of rejection(9). CD8Ts have recently been recognized as an important Treg cell subset whose dysfunction and deficiency are involved in the development of various autoimmune diseases(16, 17). The co-stimulatory signal provided by CD28 is important for effective expansion of primary T cells(25) and development of graft-versus-host disease and rejection(26, 27). Blocking CD28 results in graft acceptance and activation of CD4+ Treg cells(10, 28). It has been reported that CD8Ts are present in LT recipients(29), but little is known about the relationship between CD8Ts and clinical characteristics. In the current study, we analyzed the proportion of CD8Ts and collected information from 264 LT patients. We found that the proportion of CD8Ts was significantly lower in the graft-dysfunction group than in the stable graft function group. In addition, most recipients that recovered from graft dysfunction exhibited an increase in the proportion of CD8Ts after receiving enhanced immunosuppressive therapy, but those without recovery showed no such increase. Moreover, a higher proportion of CD8Ts was found in recipients with recovery of graft function than in those without recovery. These findings indicate that CD8Ts are crucial for maintaining the stability of graft function. Similar to the effect of CD4+ Treg cells on immunosuppression, the high proportion of CD8Ts has been confirmed to reduce the maintenance dose of immunosuppressants in recipients with cadaveric heart-kidney transplants or pediatric liver-intestine transplants(19, 30). However, in the LT cohort, we found that the proportion of CD8Ts was higher in recipients with a higher tacrolimus concentration. The mean proportion of CD8Ts in recipients with 0-5 ng/ml tacrolimus approached that of the rejection group, but was higher, and apparently sufficient to maintain stable graft function, in the 5-10 ng/ml and >10 ng/ml tacrolimus groups. Furthermore, within 1 year from the time of LT date, longer post-LT times were associated with a higher proportion of CD8Ts, but this relationship did not hold beyond 1 year. Interestingly, the effect of tacrolimus on the proportion of CD8Ts was only evident within the first year after LT. These results suggest that LT patients should be administered 5-10 ng/ml tacrolimus in the first year after LT and maintained with 0-5 ng/ml tacrolimus thereafter. In other words, the proportion of CD8Ts could be used as a precise indicator of graft function and inform decisions regarding reducing the dose of immunosuppressant administered. Importantly, we further found that immunosuppressant could be completely withdrawn after LT in 10 recipients with a proportion of CD8Ts > 30%. These findings highlight the importance of knowing how to induce and expand CD8Ts. As early as 1998, Suciu-Foca et al. confirmed that CD8Ts achieve suppression by specifically recognizing the MHC class I antigens expressed by APCs and inhibiting B7 expression in APCs(11). This group subsequently demonstrated the successful induction of CD8Ts in vitro through immunization with human PBMCs(31). Furthermore, using a second-generation CTLA-4-immunoglobulin fusion protein, Guinan et al. showed that blocking CD28-mediated co-stimulation resulted in approximately an 8-fold expansion of CD8Ts(32). A study of CD4-depleted T-cell lines further suggested that proliferation of CD8Ts requires exogenous interleukin-2(33). Unfortunately, despite considerable advances in CD8T induction methods, transfusion of CD8Ts expanded in vitro as an immunosuppressive therapy has not yet proved successful. Finally, the current study also confirmed that the proportion of CD8Ts is more important than the absolute number of CD8Ts in maintaining stable graft function, and the ΔCD8T proportion could be a precise predictor for monitoring graft function. The proportion of CD8Ts is significantly decreased in recipients with graft dysfunction compared with those with stable graft function. Age, time from transplant date, and immunosuppressants are the main factors that influence the proportion of CD8Ts. Furthermore, the proportion of CD8Ts and the ΔCD8T proportion are sensitive predictors of graft function. This work was supported by grants from the Zhejiang Provincial Natural Science Foundation of China (LY18H030002, LY14H030003, LQ13H160004, LY15H160016, LQ15H030003), the National Natural Science Foundation of China (81302074, 81373160, 81400673), Fundamental Research Funds for the Central Universities (2017FZA7009) and the Medical and Health Plan of Zhejiang Province (201472813).